Exciting projects and meaningful relationships at Emory University will be celebrated Feb. 7-8 with a 24-hour online fundraising challenge. 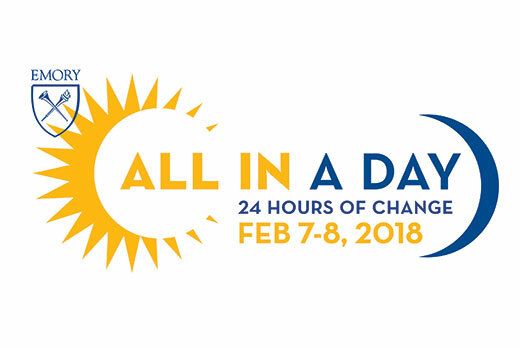 “All in a Day: 24 Hours of Change,” which begins at noon Wednesday, is expected to accelerate the momentum from last year’s debut. The final tally — $582,722 raised from 2,246 gifts — represented a nonstop day of jockeying between Emory schools, centers, departments and programs to recruit donors to match challenges and unlock bonuses. The challenge ends at noon Thursday. For many contributors, All in a Day is personal. Folashade Alao 05G 09G, director of Undergraduate Research Programs, will give to the Kharen Fulton Diversity Graduate Award, named for the Emory administrator who was an inspiration and influence during her doctoral work. Before the competition ends at noon on Feb. 8, participants can donate to any part of the university. Popular choices are student scholarships, especially at Emory College of Arts and Sciences, where last year donors made almost 400 gifts totaling $134,000. By supporting Emory College Fund for Excellence, Dooley Scholarship Endowment and other funds, donors created an immediate difference for Emory College’s high-achieving students and outstanding faculty. "Scholarships are critical to our success as a liberal arts research university: They enable us to recruit the most talented and intellectually curious students we can find — and they transform lives by enabling students to take advantage of everything that Emory has to offer,” says Emory College Dean Michael A. Elliott. The allin.emory.edu website promotes gift-matching opportunities and fundraising challenges. As the All in a Day clock ticks away, teams of volunteers post, tweet and email in a race to fundraise. Corinne Oliver 02OX 04N 10N will be rallying alumni nurses to reconnect to Emory and support the Nell Hodgson Woodruff School of Nursing. All in a Day is scheduled during Founders Week, which marks the first meeting of the Board of Trustees in 1837 following the founding of Emory College. Alao, Oliver and almost 500 volunteer ambassadors will help get the #allinemory word out and drive competition. They make a difference: Last year, 35 percent of All in a Day gifts resulted from ambassador outreach. To volunteer as ambassador or give during All in a Day, visit allin.emory.edu.